The Donut Friar: Real. Good. Doughnuts. 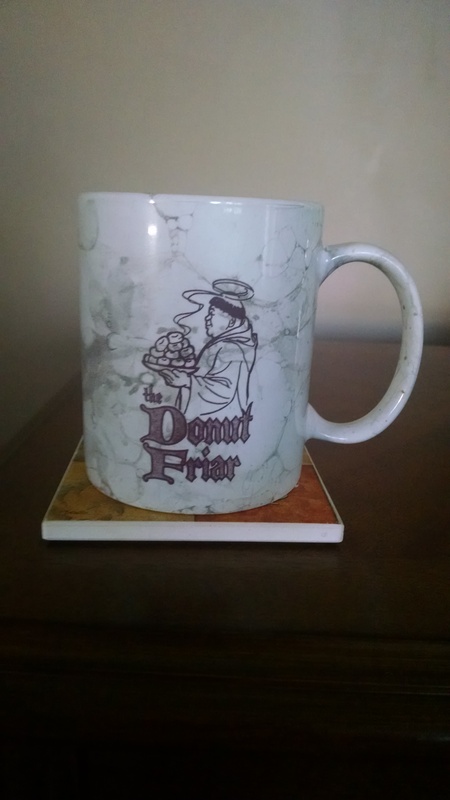 Sure there are plenty of places to eat breakfast in town, but if you don’t want a big breakfast, a perfect alternative is The Donut Friar located in The Village. The Donut Friar opens early. Real early. Try 5 in the morning when most shop employees and tourists are still in bed. They have provided tourists and locals with fresh doughnuts here since 1969 and are showing no signs of slowing down. It is a small bakery tucked away in The Village by the fountain, but they manage to have a few tables inside with some seating upstairs as well. They also have mugs which I could not resist buying one on our first trip in 2011. Of course, you need to try their doughnuts. In my opinion, they stand as the second best doughnuts I have ever eaten, and I’ve had my fair share over the years. They offer the standard glazed, along with several different cake doughnuts, cinnamon twists, and powdered sugar with cream and fruit fillings. The Donut Friar also bakes cookies that are quite tasty as well. My absolute favorite is the cinnamon cake donut that is not only a party in my mouth, but easy on the wallet. Most of the pastries cost just pennies over a dollar. The most expensive I believe is The Friar’s Special which is a chocolate-iced doughnut with vanilla cream filling on the inside, and a vanilla cream smiley face on top. They also make cinnamon bread, which is my wife’s favorite. Sometimes they run out, since availability is limited due to its popularity. One final note about The Donut Friar is that they are a cash only establishment. This is never a problem for us since we always take cash with us when we are out and about in town, but for those who aren’t aware of this fact, it can be an inconvenience; especially in the 21st century. They do have an ATM inside for those who don’t have cash, and yes, there is a small fee. Overall, this one of the places you must visit in Gatlinburg. Most visitors do agree with me that these doughnuts are probably the best you’ll find in the Smoky Mountains, so get up early and stop in for a tasty treat.